"When your enemy has a water based attribute, the effectiveness of my attacks will always be reduced by half." Hummmm... okay. That is probably something you expect to hear from your fellow party members in an RPG during the first part of the game when they try to get you familiarized with the system, but probably not from a water based summon spirit in an anime, right? Guess what! That was actually a direct quote taken from the first episode of the anime series Tales of Eternia the Animation! Although it would be fairly inaccurate to say the series is filled with silly little remarks like the one mentioned above, it WAS one of the few unique things I found in this anime that I think really makes it stand out from the rest. Tales of Eternia was originally the third installment of the Tales of Phantasia video game series that first got it's start from the good old Super Famicom (aka SNES in the US). Following the footsteps of several of the relatively successful video games-to-anime series such as "Arc the Lad" (recently announced as one of the big titles that ADV will be releasing this year in the North American region), Wild Arms and Sakura Wars among many others, Namco and Xebec once again proved that big name video game stories often make great anime series, especially at a time when innovative, big-hit story lines are getting harder and harder to come by. This thirteen episode epic talks about the adventure of our four heroes, and their journey across the land to gather all the summon spirits in order to stop the Great Fall. Legend has it that when the Grand Fall happens, the opposite worlds Inferia and Celestia will collide, destroying one another in the process. How can this happen? Simply imagine the two cookie pieces of an oreo, the white stuff inbetween would be everything and everybody living in Inferia and Celestia if our heros fail to stop the Grand Fall. 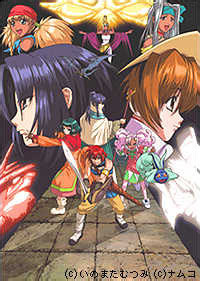 In comparison with some other anime series of the same length (12 to 13 episodes), Tales of Eternia the Animation may lack that attractiveness you may see in science fiction series, but it still possesses that special element that makes all fantasy anime interesting - the originality of a unique world that few have thought of before. Instead of the typical government conspiracy, mecha-fighting, mind blowing (and more often than ever, confusing) story line in a sci-fi series, anime fans will actually be able to just relax and enjoy this anime without having to worry about missing out on hints, important quotes by some mysterious character without a name, or having to watch it at least twice to make sure you didn't miss anything. Worlds that are shaped not as spheres, but as two great plates facing each other; high quality artwork; and interesting character designs truly make Tales of Eternia the Animation stand out from the rest of the pack. Not to mention, from the view of an import game fan, it really comforts me to see that they did not stretch a story originated from a game to a full size series (25 to 26 episodes series) just to make a few more bucks, which surely would have ruined the story itself. The soothing, but yet energetic opening - "Sora ni Kakerubashi" (Bridge Leading to the Skies) and the soft, gentle ending theme - "I'd Love You to Touch Me" also makes it a must-see, especially fo fans of Okui Masami, the singer and songwriter of both of these tunes. These are both exceptional songs, even if we were to listen to them without the nice visuals that accompany them in this series. So if you are an otaku who likes fantasy adventure series that has sword fights, magic, and monsters, this is the one for you!